It was a rainy and cold afternoon here in Indiana, so I pulled out lots of crafts for this kids and then went downstairs to hide from them with this new Maya Roads Coaster Box. The box comes with 8 scolloped edge coasters that are hooked together with a little chain. I decided to select 16 of my favorite pictures from 2006 & keep this sweet little box for just for myself! Who knows, maybe I'll go grab a couple more and make them for Mother's Day gifts. 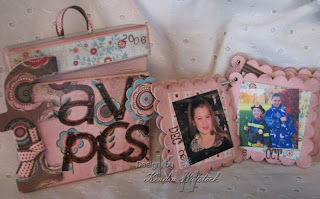 Paint the edges of the box & all the coasters (both sides) with pink acrylic paint. Set aside to dry. Measure and cut paper for the little box. I cut out a separate piece for each side and for the sides of the lid. Apply Modge Podge with a foam brush over the sides of the box & then add the paper. Apply another coat of Modge Podge. Set aside to dry and do the same thing on the lid. With Chocolate Chip ink, lightly apply ink to the edges of the coasters and the box. I like to use a stipple brush. Set aside to dry for a few minutes. Apply a light coat of Modge Podge over the box again. TIP: When using Modge Podge over dye ink use a light touch because the ink WILL SMEAR. If you are going for the distressed look, you should be OK, otherwise, you may want to test it first to see how badly it smears. 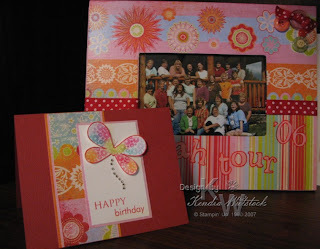 Cut coordinating patterned paper squres and select pictures for your coasters (16 total). Add desired embellishments to the front of the box & a ribbon pull on the lid. TIP: I used an anywhere hole punch to make the holes on the lid then added the ribbon & tied a knot on the inside to make the ribbon pull. TIP: Don't add too many embellishments to the coasters because then they won't fit into the little box! Supplies Used: Box & Coasters: Maya Roads; Paper: Basic Grey Blush; Ribbon: Basic Grey; Chipboard Letter: Stampin' Up; Acrylic Paint: Making Memories; Stamps: Stampin' Up (letters) & Hero Arts (Months and #'s); Ink to distress the edges: Chocolate Chip (Stampin' Up! ); Die Cut: Cuttlebug Flower Die. I am so happy it's Friday! I don't work on Friday's & the kids were at school, so after a very busy week, I spent some quiet time at home. Gee, I'm sure you won't be able to guess what I did today ~ LOL! Yes, I stamped today. I'm pretty hooked on these pretty little Paper Trey Ink Butterflies, so I whipped up some fun little birthday cards using them. I hope you enjoy my little creation for today! Supplies Used: Stamps: Butterfly Kisses (Paper Trey Ink); Paper: Bazzill; Ink: Cool Caribbean Classic Ink & Certainly Celery Craft Ink (Stampin' Up! ); Ribbon: Michael's; Brads (Unknown). Stamp the butterfly outline in red onto white cardstock ~ if you stamp the outline it makes it much easier to cut out when you're finished. Stamp flower butterfly with VersaMark Ink over the top. Using my Stampin' Pastels (Chalks), I selected 6 or 7 colors from my pattern paper & lightly added color to a small section of flowers. Cut out the butterfly ~ be careful not to touch the newly chalked image too much while cutting or it will smear. I don't like cutting the image out first because it's easier to apply the chalks when you have a larger piece of paper to hold on to. Once your image is cut out, slightly bend the wings for some dimension and attach it with Glue Dots. I added some little sparkling bling from Hero Arts for the butterfly trail. To apply the color, I like using eyeshawdow makeup applicators. Always use a different applicator for each color so they stay nice and bright. To apply the colors to the VersaMark ink, use a light swirling action. Don't rub it too hard or your VersaMark will smear. I made the frame last fall at a retreat with some of my favorite stamping girls. The Queen of Frames, Lisa Zappa, had a class and showed us all the techniques. 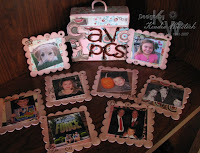 Supplies on the Frame: Paper: Basic Grey Gypsie; Ribbon: May Arts; Stamps: Foam Stamps by Making Memories. Other: Buttons & Modge Podge. First of all, I had a followup appointment with my Oncologist this morning and I'm done for 3 months! YIPEEEE!!!! This will be the longest stretch of time without a doctor appointment in about a year and a half. Second, the sun is out and it's in the 70's! Buds are coming out on the trees and the flower bulbs are starting to bloom. And, I talked to my dear friend Paula in Arizona and I had lunch with another fabulous friend Michelle. We were finally able to catch up! It had been way too long since we have been together to chat! Last night I found some time to play with my new Paper Trey Ink sets! WOW ~ these sets are fun! There are so many coordinating pieces. For me, it's going to take some time to get used to using the acrylic stamps, but they are a wonderful quality and the packaging is fabulous. I highly recommend these sets! This is a picture of my first attempt with these beautiful images. Thanks to my very talented friend Michelle Wooderson for her wonderful idea on the wavy greeting. I hope your day is as wonderful as mine has been! 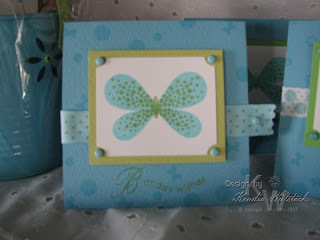 Stamps: Butterfly Kisses (Paper Trey Ink); Ink: Certainly Celery & Chocolate Chip (Stampin' Up! 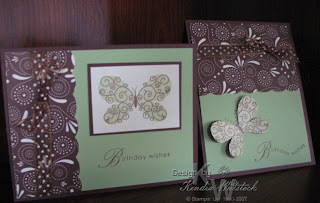 ); Paper: Certainly Celery, Chocolate Chip, Very Vanilla, Designer Series Au Chocolat (Stampin' Up! ); Ribbon (May Arts). Don't you just love DOODLES! I'm a little doodle crazy right now with all the fun new sets available from Stampin' Up!, Hero Arts and Autumn Leaves. I'm not great with them yet, but practice makes perfect ~ right? 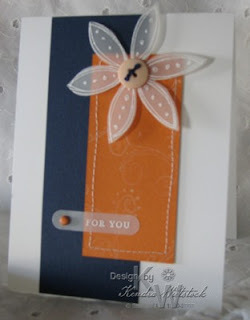 This card was inspired by a card in the 2007 Hero Arts Catalog by Jennifer McGuire ~ one of my favorite stampers! Stamps: Doodle This, Happy Everything (Stampin' Up! ); Ink: White Craft Ink (Stampin' Up! ); Paper: Night of Navy, Pumpkin Pie, Whisper White, Vellum Cardstock (Stampin' Up! ); Other: Button, brad (unknown). I'm lovin' the doodles out right now. This is a sketch challenge I put together for a group of my friends. I used the new Doodle This & Doodle Alphabet sets from the Stampin' Up! Spring Mini catalog. Stamps: Doodle This, Doodle Alphabet Stampin' Up! 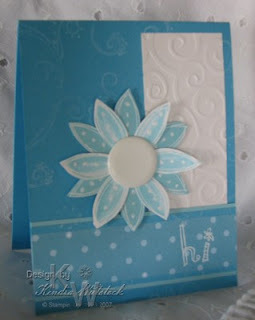 Ink: Whisper White Craft Ink, Stampin' Up! ... into the great unknown of blogging! Who knew I would have enough to say that I would need a blog. My friends seem to think it's a good idea, so off I go! I want to thank my sweet friend Beth Silaika for the beautiful Blog Banner and input on my title. Your talents are simply amazing!